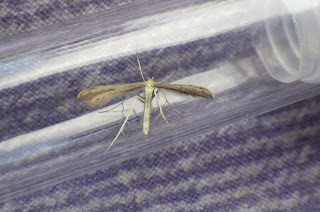 I did n`t have time for a planned walk yesterday (Weds, 10/5) afternoon, when I`d intended to visit a couple of local sites to search (looking, sweeping and beating) for daytime moths. Instead, I decided to simply have an early evening visit to some coastal habitat very close to my home at Pwll - a short foray before returning home to `put my feet up`. In the event, I was out for an hour and a half as it was pleasantly surprising how many moths (numbers and variety) were to be seen in the warm, almost windless conditions between 6.30 and 8.00 pm. Indeed, after going through the tubes of micros that I`d taken home and the moths that I`d seen in the field, the final total was a profitable c.30 species. The areas that I visited included an old mineral line Ffordd y Wagen as it is known locally (though the name does not appear on any map) - a length of `good habitat` - elm trees, diverse herbaceous vegetation and next to a fen/woodland SSSI. Then onwards to a small compact area of brownfield before finally, reaching wetland habitat around the Pwll Fishing Lakes (the name alluding to a failed venture, but the habitat is rich). It was perhaps this diversity of habitat and the fact that the moths were clearly `out` (with some tortricids engaging in territorial or courtship flights) and others visible atop vegetation, that led to the good totals. I`ve previously walked the very same areas, net in hand, on sunny afternoons and seen extremely little - dusk can be good to find moths, micros in particular. Most of the moths recorded were common species and some I`d caught before there by leaving actinic traps at these sites overnight, but perhaps the nicest of the moths seen yesterday were the hemp agrimony plumes Adaina microdactyla, noted flying in a wet ditch around the afore-mentioned plant. 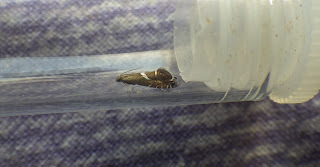 Above: the tiny Adaina microdactyla, several of which were seen. Glyphipterix forsterella was seen in some numbers around fen vegetation and its commoner relative G. simpliciella was also noted. Above: G. forsterella - note the (but vague in this photo, due to angle of light) silver spot in the `eye` at the bottom right-hand corner of the wing. Click on pic to enlarge. 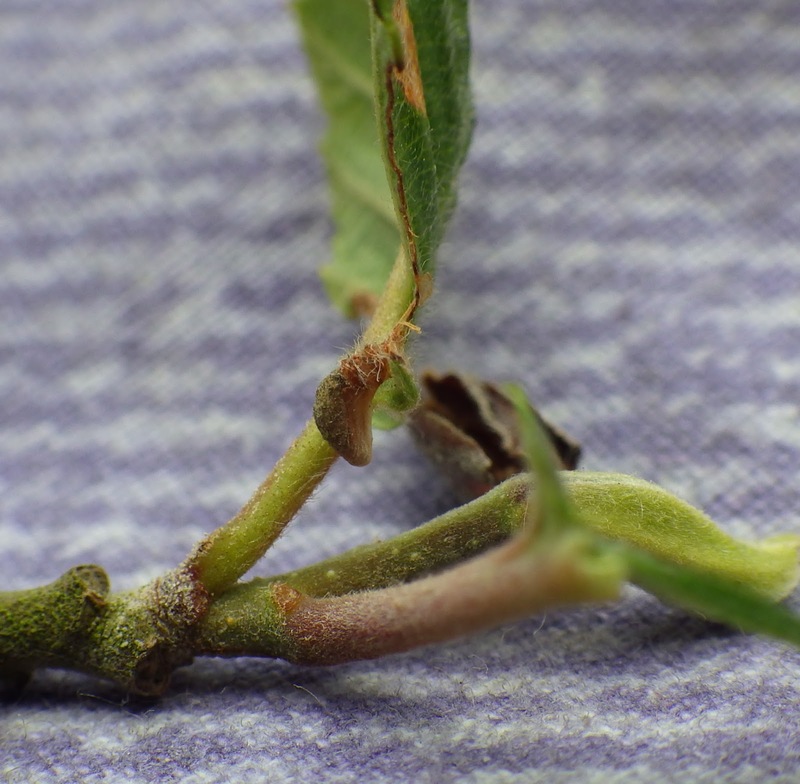 Above: I spotted this Coleophora larval case on grey alder. Both George Tordoff and I reckon that it`s C. serratella. It looks that it may well be a good night to trap tonight (Thursday). Don`t let any forecast light rain discourage you... good numbers (and variety) of moths can occur in such conditions.